I saw this before but thought it was a joke, holy **** that is awesome. 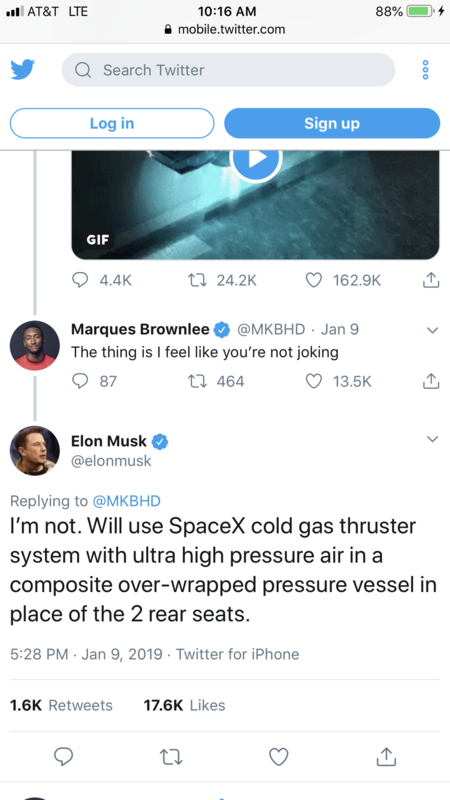 This is in regards to tesla roadster space X package. A gas thruster system in a car? what? Since he only shared the response we have no idea. Yes, Literally a compressed gas thruster, just like in space. 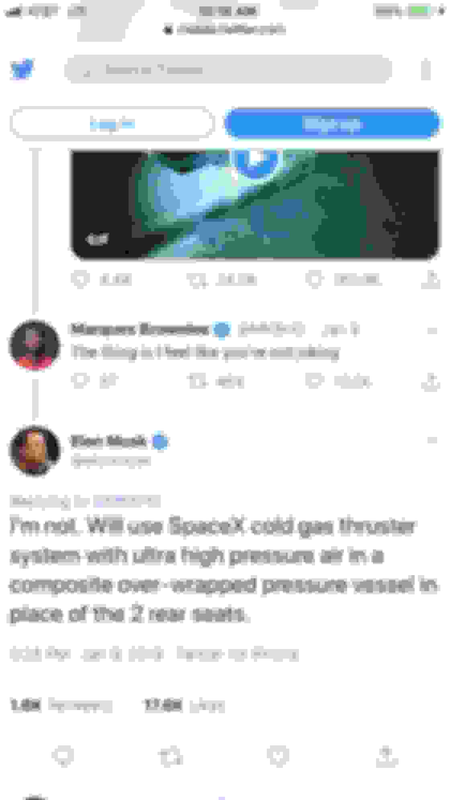 ******* Elon Musk. Find the absolute limit of traction, and say "**** it, it needs to be faster"
how anyone can not like him/tesla I have no idea. and then goes and does it (well we don’t know for sure yet). The fact that he’s actually trying to implement the idea is just 11/10 awesome. I like him, but I'm afraid he's too egotistical not to see when he's about to make a mistake. Tesla as a brand is not doing well in reliability and livability ratings. You're in love with aspects of the car, but as time goes on problems start to pop up. And even Apple will tell you that a giant iPad is not necessarily the best solution for a driver interface. I've looked at and drive Model S and Model X, and although I love the idea, they're not quite for me. It's as if Tesla needs to buy or be bought by an automotive company like Toyota or a very service oriented company like Apple, to really get where they want to be. Other than the whole being a terrible person part? Yeah, other than that part. I was excited when rumors were circulating about GM and Tesla partnering up for a truck. There was so much to be gained by a cooperation like this but turns out it was just that, a rumor. You are such a wet blanket. I bet you're a hoot at parties. If only I called people pedophiles, then I'd be cool. I disagree, I daily a 100D, got it with 18k miles, and have put another 15k on it with literally no issues whatsoever. I hate Apple products as a whole, and the touch screen doesn't bother me. The autopilot operates flawlessly as well. My only complaint, which is really a non issue, is that when it's lower than about 25 degrees outside, the range gets cut by about a third to half, but that still leaves me 150 miles on a full charge which gets me to and from the ski hill under any circumstances, and that's my longest drive, so I'm not bothered. Again, wet blanket. You can toss the first stone if you can prove you've never said anything asinine, okay? Or you know, privatized space flight, mainstreamed EV technology, contributed millions to philanthropy, etc. But please, tell me more about what an authority you are on ********. really? I’m surprised the battery doesn’t warm up during usage and restore the range. That’s what happens to my power tools. I’m really surprised you hold so much weight with consumer reports. The real world reliability and cost of ownership reports from high mileage users are fantastic. how do they make heat? Resistance heat? Heat pump? Good news guys, Henry Ford has been cleared of nazism because his business was successful. Agree. Outside of isolated cases (with any manufacturer) that you hear on forums/YouTube videos, I know a few people with Teslas and they all love it. Some are on their 2nd already. There are many parts of the USA where a Telsa is still a major head turner, so one with issues might stand out. Here where I am, I see maybe 10 in my 10 minute drive to the train station....where another 10 are parked. Personally, who cares about Elon (whether you like the dude or not). You're not dating the dude. You're driving a car. I would love to have one as a daily, I just think it is a little too much money for me. Last edited by shamoo; 02-14-2019 at 08:22 AM. Haha it is. From what I understand, the heater core is a resistance type heater, like those portable radiant heaters with the dish. The rest of it, moving the air, etc works like any other auto blower.